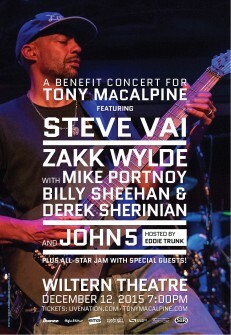 Guitar legends Steve Vai, Zakk Wylde and John 5, along with drum powerhouse Mike Portnoy, bass icon Billy Sheehan and keyboard phenomenon Derek Sherinian are joining forces to play a benefit concert for our friend (and H&K endorser) Tony MacAlpine, who was recently diagnosed with colon cancer. The Benefit for Tony MacAlpine will take place at the Wiltern Theatre in Los Angeles, USA on December 12 2015, at 7:00pm. The event will feature performances from John 5 & The Creatures, Zakk Wylde with Mike Portnoy, Billy Sheehan and Derek Sherinian, and Steve Vai and band, with the evening culminating in an all-star jam with house band Portnoy, Sheehan, Sherinian featuring special guests. Steve Vai, John 5, Joe Bonamassa, Steve Stevens, Paul Gilbert, Steve Lukather and Joe Satriani have also all donated personal guitars to be auctioned during the event. We’ve also donated a GrandMeister 36 to be raffled off on the night alongside gear from the likes of Ibanez, EMG Pickups, Ernie Ball, Source Audio and Voodoo Lab. Everyone at H&K – and the whole music world – is rooting for you.